Her two-dimensional tiles are cut from large slabs and textured with drill bits, meat tenderizers, ping-pong paddles--random objects shes been collecting over the years. Each tile is then glazed and removed--red hot--from the kiln and transferred to a lidded metal container. Pacin then sprinkles the tiles with pine needles, which smolder and burn, creating an atmosphere that pulls oxygen out of the tiles and creates the vibrant lusters, crackled glazes and velvety smoke-blackened clay. 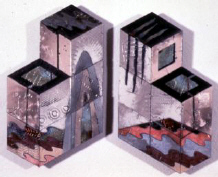 To complete a piece, she mounts the tiles on black or clear Plexiglas--arranging them to challenge the viewers two-dimensional perspective.